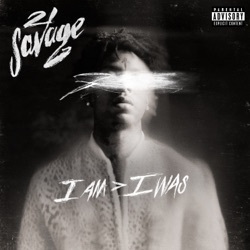 I Am > I Was is the second studio album by 21 Savage, released by Slaughter Gang through Epic Records by Sony Music on December 7, 2018. There is no doubt that 21 Savage is the star of the show, and that his style can be pretty dynamic. Overall, it’s a massive improvement on the disappointing Issa Album, with 21 Savage showing maturity whilst keeping his dark humour and persona. It works, largely because of 21 Savage’s dominating tone and delivery, and makes things stick that may ordinarily not work. With i am > i was, he’s punching above his weight, releasing a pretty-good album that’s much better than it had to be. The power in Savage’s music still lies in the gulf between what he is expected to feel and what he actually does: that brilliant vocal cadence suggests he is surveying the cars and girls of his new life with numbed distance, even disgust. i am > i was shatters the notion of 21 Savage as a specialist with a narrow purview and audience, and recasts him as a star in waiting, all without forcing him into unflattering contortions. A journal chronicling the maturation of the mind and what comes with it. I Am > I Was is unequivocally the moment we will start to view 21 Savage with a thicker lens, with respect to past misgivings, and most importantly, with a positive outlook on the bright future that lies ahead for the Slaughter Gang initiative. Overall, i am > i was is a mixed bag of experience that offers enough solid tracks to keep fans latched on. With his work ethic, he’s only going to get better, and this album shows that his potential is off the charts. A year of anticipation and mystery, 21 Savage’s sophomore album proves he’s a versatile and gifted rapper who has a lot to say. He delivers something that hints at the new, while flirting with the old. Rather than stick on the trap track, he finds swerving R&B grooves and melodies that are equally durable. On his highly-anticipated but delayed sophomore album, 21 is better than he’s ever been.